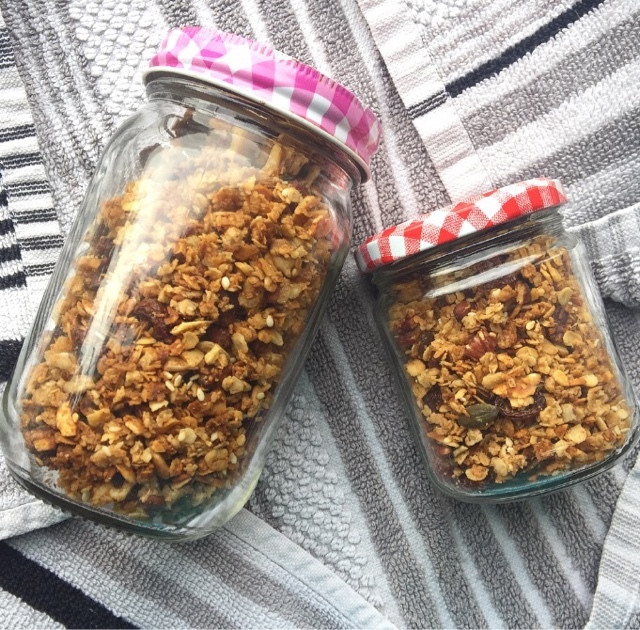 When I used to hear about people who made their own granola, they immediately reached a new level of domestic goddess in my mind. That was until I realised that anyone can whip up a big batch of this breakfast goodie in about half an hour! 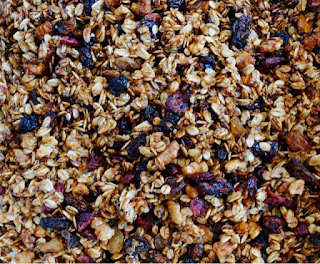 This recipe is truly irresistible, thanks to the crunchy texture of the toasted nuts and seeds and the clusters of baked oats. The sweet, chewy sultanas, together with maple and cinnamon undertones, make this the most scrumptious breakfast treat ever if I may say so myself! 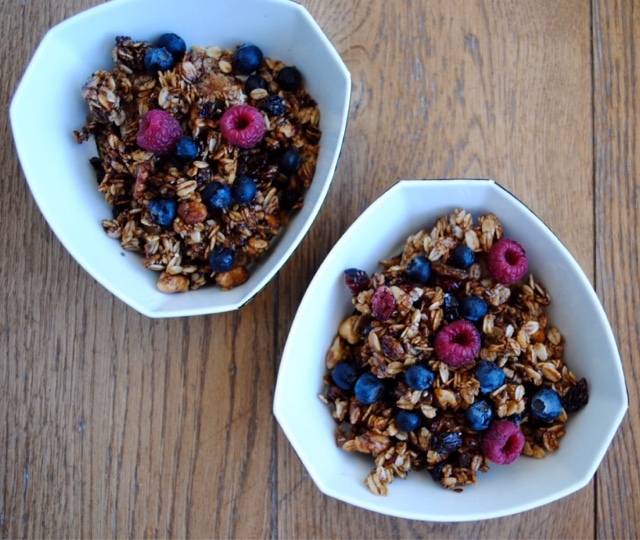 Ever since I learned how easy it is to make my own granola, I haven’t stopped trying out new versions, like this Chocolate Chip Quinoa Granola, this Salted Almond Butter Granola, this Nutty Cinnamon Granola and this Banana Nut Crunch Granola. Use this to top your Açaí Bowl, sprinkle it over smoothies, chuck a handful onto your Healthy Chocolate Mousse to add a crunchy dimension, throw it over your Chocolate Peanut Butter Cup Shake or Post-Workout Chocolate Milkshake, or have it on it’s own drenched in my 2-minute Pecan Milk with a sliced banana on top! 2. Melt the coconut oil on a low heat on the stove with the maple syrup and cinnamon until it dissolves into a smooth liquid. 3. 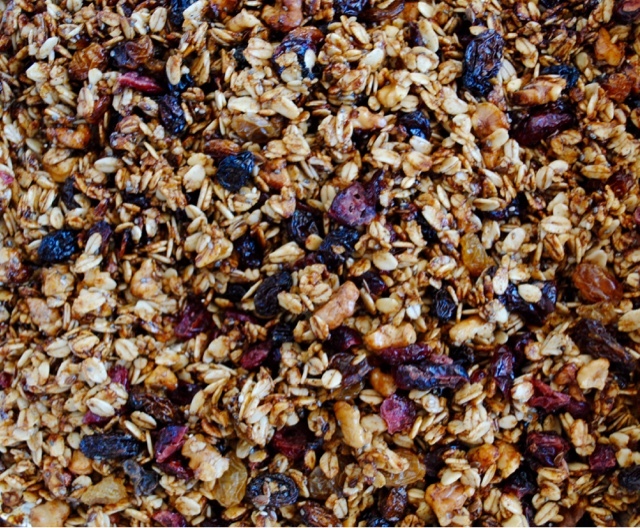 Add all the dry ingredients (except the sultanas) to a large bowl, and mix together. 4. Pour the sweet liquid into the bowl and keep mixing. 5. Spoon the mixture onto a lined baking tray and bake for about 30 minutes at 180 C, opening the oven every 10 minutes so that it bakes evenly and doesn’t burn. 5 minutes before it the end, stir in the sultanas. 6. Remove the tray from the oven and allow it to cool so clusters form, before storing it in an airtight container at room temperature to keep it crunchy.